The calculators on this page are specifically intended to be carried in the pocket and some can maintain a balance of money. Their names reflect this by incorporating "Check" (Cheque in the U.K.) or "Billfold" (Wallet in the U.K.), and for their year of manufacture they are especially slim so that they do not leave a bulge in the pocket. Distinctive features: Cheque (check) account calculator. Balance still stored when switched off. 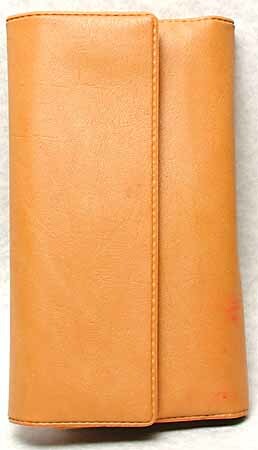 A standard 4-function calculator incorporated in a wallet for balancing a bank cheque (check) account. Unusually for this early date, the balance is stored even when the calculator is switched off, and can be recalled when switched on again. This is achieved by maintaining power to at least the memory. Manufacturing company not known (has logo which may be "AD"). If you have more information about this model please get in touch with us. Distinctive features: Very basic cheque (check) account calculator. Only has "+" and "-" functions. Balance still stored when switched off. This is a very basic calculator in a folding case for balancing a bank cheque (check) account. The display has a fixed decimal point for currency calculations, there is no decimal point key, and the only functions that provided are "Deposit" (add) and "Check" (subtract). 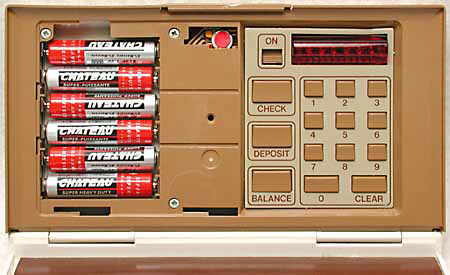 Like the Check Tronic above, the balance is stored even when the calculator is switched off, and can be recalled when next switched on. Again this is achieved by maintaining power to at least the memory. Made by Corvus Corporation, of Dallas, Texas, a subsidiary of Mostek, the Semiconductor manufacturer. 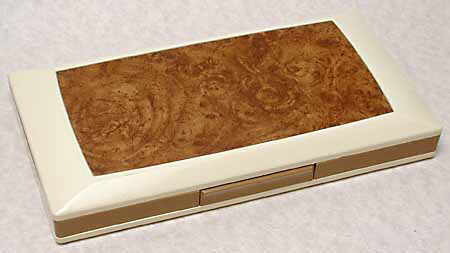 In June 1975 JS&A National Sales Group was selling this model at the "introductory price" of US$39.95. When l tapped an imaginary checking-account balance into Mostek Corp.'s new CheckMaster, I was amazed to learn the electronic checkbook would remember the dollars-and-cents figures for up to one year. Six penlight cells power the unit's low-current memory. As you write checks or make deposits, you perform arithmetic with CHECK, DEPOSIT, and BALANCE keys. And CheckMaster shows the overdraft amount, if any. (Jot down your balance and you can also use CheckMaster as an add-subtract calculator). bur.) The $40 eight- ounce unit is 7/8 by 3 5/8 x 6 3/4 inches. Distributor is JS&A National Sales Group, 4200 Dundee Rd., Northbrook, Ill. 60062." With the battery cover removed, showing the 6x AAA batteries. The Check Tronic and Corvus CheckMaster calculators above have the unusual feature, for this early date, of storing a number when the calculator is switched off. This is achieved by maintaining power to, at least, the memory and requires the very low power consumption possible using C-MOS (Complementary Metal Oxide Semiconductor) integrated circuits. However, if the batteries are removed the number is lost. 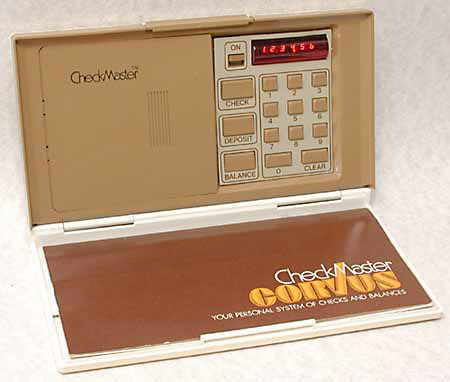 The Corvus CheckMaster is probably the least capable electronic calculator ever marketed, since it is only capable of addition and subtraction, though this is all that is required for its design purpose. Distinctive features: Cheque (check) account calculator. Takes unusual Flat-Pak battery. 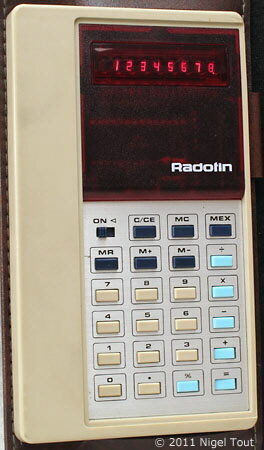 This is a really just a slim calculator incorporated in a billfold (wallet), and, unlike the Check Tronic and Corvus CheckMaster calculators above, it does not retain memory when the power is switched off. 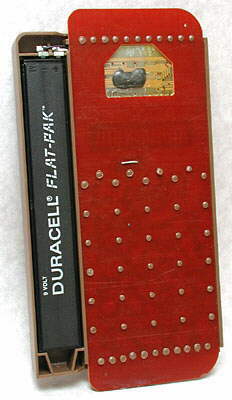 9v special Duracell "Flat Pak" battery. This example appears to be a promotional item for the preview of the 1977 range of Buick, Oldsmobile, Pontiac, and GMC motor vehicles, which was held on June 16, 1976. Made by in U.S.A. by National Semiconductor. 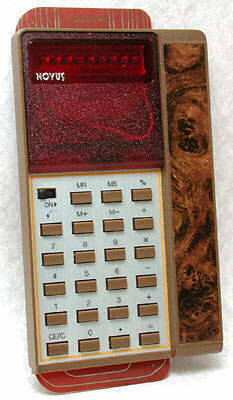 The calculator is unusual in that it is held in the billfold by extensions of its circuit board which pass through slots in the synthetic leather. 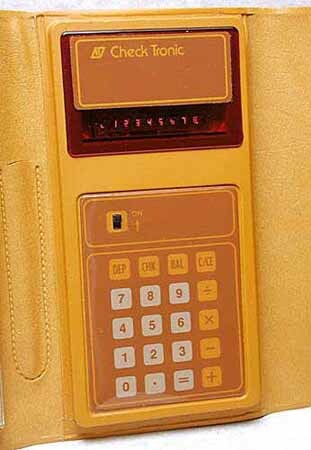 The calculator must be removed from the billfold to replace the battery. The battery used in the calculator is a very unusual 9 volt Duracell "Flat-Pak". 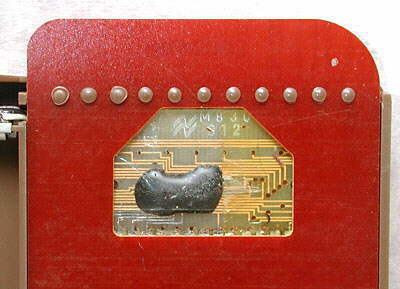 The semiconductor chip used in this calculator is directly mounted on the circuit board and then encapsulated in a blob of resin for protection. This reduced the cost but was very unusual for the time, though is now very common. 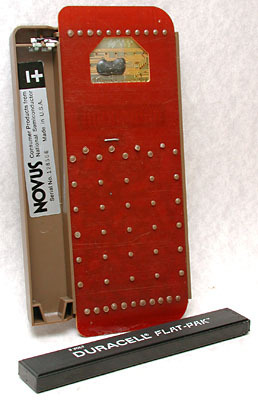 National Semicinductor also used this technique in its Novus 650 "Mathbox" calculator. 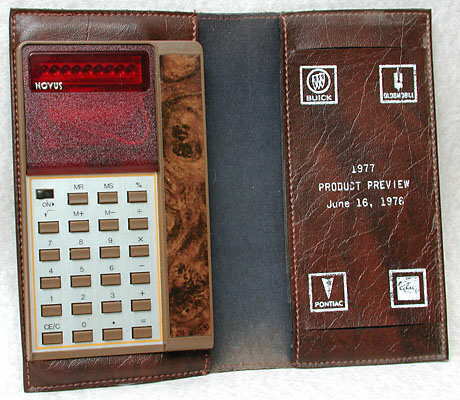 This calculator is similar to the Novus Billfold 91, above. 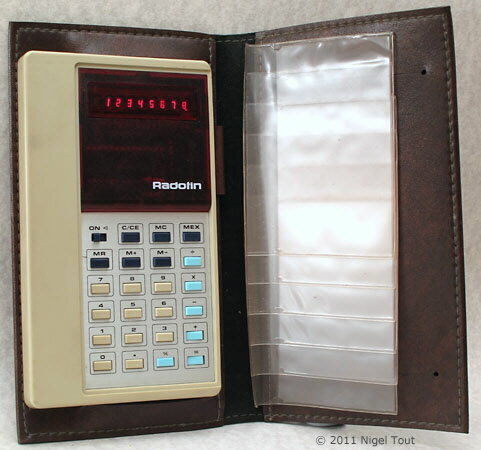 Again it is a really just a slim calculator incorporated in a billfold (wallet), and, unlike the Check Tronic and Corvus CheckMaster calculators above, it does not retain memory when the power is switched off. 85 x 170 x 12 mm / 3.3 x 6.7 x 0.5" (calculator only). Popular Science, June 1975, p133. Popular Science, August 1975, p11.